Since his mother and father separated, 15-year-old Julian Hale has found very little joy in his life. He has always been closer to his mother, and without her he feels lost. Julian is counting down the days until he can leave North Carolina for the summer and reunite with his mother in her new Florida residence. The absence of his mother brings Julian closer to his father, and he begins to understand all the things his father sacrificed so his mother could follow her dreams of becoming a published author. Julian’s friendship with his elderly neighbor Old Lady Peters helps Julian to heal and look for the simply joys in life. He has always been a wonderful cook, but through her encouragement he discovers he has a passion for it. When summer finally approaches, Julian is torn about leaving his father behind, as well as his romantic interest, Tia, who also shares his passion for cooking. Will Julian stay forever in Florida, or can he convince his mother to come home with him? 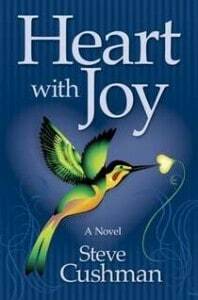 Heart with Joy by Steve Cushman, told from the first person perspective of a 15-year-old boy, tackles sensitive issues such as broken families and death, but softens the ache with new beginnings, the blooming of first love, and acceptance. Julian’s relationship with his father was very heartbreaking to start with, but as the two spent more time together Julian was able to appreciate his father for who he is and even help him rediscover his own passions. In many ways, Julian was more the parent than either his mother or his father. I was sympathetic to his father, but his mother was very difficult to like. I couldn’t understand why Julian thought so highly of her and I wanted so much for his father to associate his happiness with someone other than her. The ending of the novel is a bit ambiguous as to how their relationship will be resolved, but it is at least hopeful for a reconciliation. Cushman’s writing style is very simplistic and straightforward, which is appropriate since it is told from Julian’s point of view. It still left something to be desired for me, however, but I cannot pinpoint exactly what that is. The novel was poorly edited, unfortunately; I caught several sentences that were in need of some fixing, as well as mix-ups such as “by” being used where “buy” should be. The phrase “heart with joy” is a bit overused, in my opinion; I felt it only needed to be used just once so the reader could understand the significance of the title. I liked Heart with Joy well enough, but it didn’t blow me out of the water or convince me that I want to immediately run out and buy Cushman’s other novels. It was a good effort, but it just didn’t make the grade.